Admissions Open at Amy Public College of Management and Sciences's Main Campus for the batch Fall 2018. APCOMS offers admissions in different fields of study for Bachelor Programs. University DescriptionThe Army Public College of Management and Sciences, commonly known as APCOMS, is a private college located in Rawalpindi, Punjab, Pakistan. It was founded in 1999 under the administrative control of the Inspector General Training & Evaluation (IGT&E), Pakistan Army. 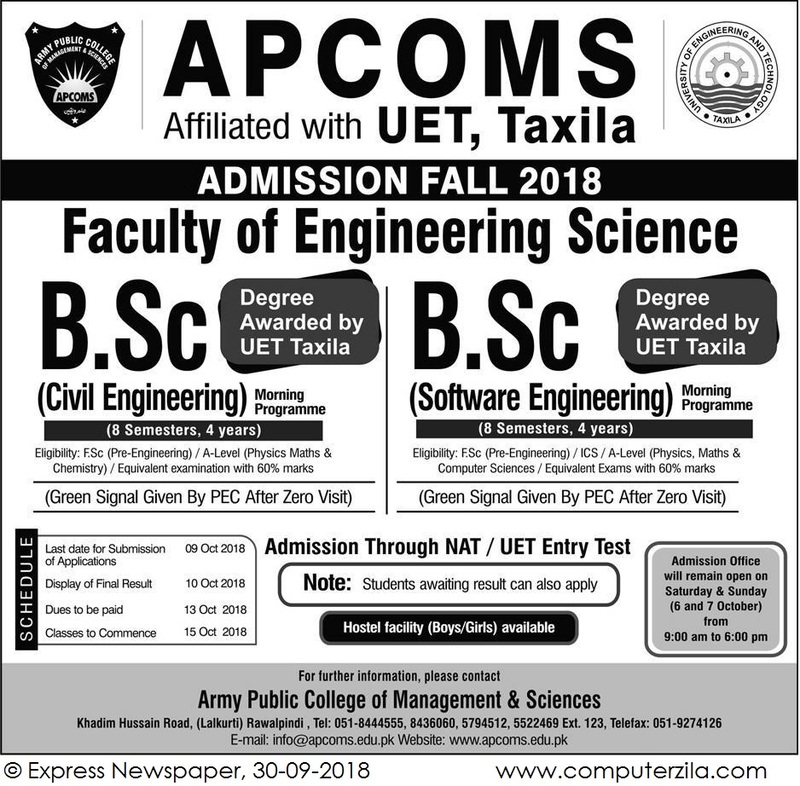 Its engineering programs are affiliated with University of Engineering and Technology, Taxila (UET,Taxila) and management programs are affiliated with National University of Modern Languages, Islamabad (NUML). Initially, it started only management sciences and software engineering and then started electrical engineering in 2007. Campus AdressArmy Public College of Management & Sciences, Khadim Hussain Road, Rawalpindi Cantt, Pakistan.